Gain the knowledge, skills, and mindset to thwart attackers with handguns and rifles. What would you do if someone pulled a gun on you? Handguns are by far the most common type of weapon used in violent attacks in America. According to the FBI crime statistics as of 2016, handguns comprised almost half of all weapons used in murders committed in the United States. This 2-day seminar will cover basic and advanced handgun attacks, as well as defenses against long guns. The Krav Maga approach to handgun defense and disarming attackers is efficient and effective, using simple, instinctive movements to rapidly build your survival skills. 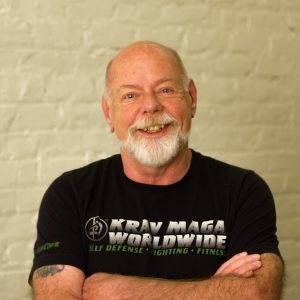 Krav Maga Black Belt and KMSF Owner Barny Foland will take you through common handgun threat scenarios, teaching you strong defenses, combatives and safe disarming techniques. Although this seminar is open to all levels, you will get to play with advanced Krav Maga techniques.